for Soil Testing - This is for the determination of the sub sieve particle distribution in a soil sample by mechanical analysis. An analysis of this kind expresses quantity the proportions by weight of the various sizes of particles present in the soil. It is recommended as a standard procedure to use dispersion agent to avoid flocculation. 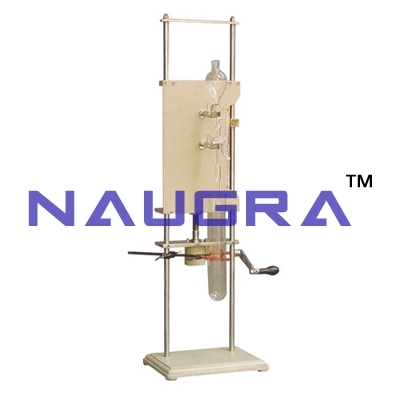 The apparatus consists of a sliding panel which moves up and down by means of a screw allowing Anderson pipette fixed to it to be raised or lowered vertically. A sedimentation tube is held by a laboratory clamp provided on the stand below the pipette. The depth of immersion is measured by a scale graduated in mm at the side of the sliding panel. Supplied complete with Anderson pipette 10ml. At the side capacity made from glass, and a sedimentation tube also of glass of 500ml capacity and 50nos. Test form pads. ACCESSORIES & SPARES : 1) Sedimentation Pipette (Anderson pipette) 25ml. 2) Sedimentation tube 100ml 3) Sedimentation pipette 10ml 4) Sedimentation tube 500ml 5) Test forms pad of 50. We are leading manufacturers, suppliers & exporters of Grain Size Analysis Pipette Met For Testing Labhod for Soil Testing Lab. Contact us to get high quality designed Grain Size Analysis Pipette Met For Testing Labhod for Soil Testing Lab for schools, colleges, universities, research labs, laboratories and various industries. We accept bulk orders for government tenders in all countries around the globe.